The San Juan range forms the southern part of Colorado's Rocky Mountains and is thought by some to have the best, most varied scenery of all. Spanning the continental divide, it has numerous jagged volcanic summits, 13 of which rise to over 14,000 feet, many lakes, waterfalls and streams including the source of the Rio Grande, several historic towns and countless relics from the gold and silver mining era of the nineteenth century, this latter reflecting the extensive mineralization of the range, as evident from the vivid colors of many of the rocks. Map of the San Juan Mountains, showing roads, towns and the major peaks. Almost all of the land is publicly owned, within parts of the Uncompahgre, Gunnison, Rio Grande and San Juan national forests. 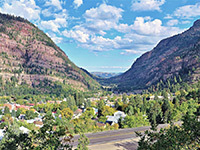 The western third is the most accessible, and many of the well known sites are found close to a loop drive (The San Juan Skyway) along roads CO 145 and US 550, over 200 miles of dramatic, winding roads that pass the old mining centers of Silverton, Ouray and Telluride. Silverton is the northern terminus of the Durango and Silverton Narrow Gauge Railway, one of only two remaining stretches of a once extensive system that criss-crossed the southern Rockies. 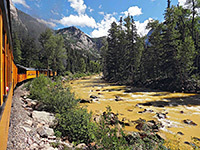 The railway follows the deep, forested Animas Gorge for 45 miles through several tunnels, over high wooden bridges and across the face of steep slopes, and is a very popular attraction, usually open from May to October. Most of the central San Juan Mountains are reachable only on foot or jeep trails - an area 40 miles square with no paved roads that includes about 80 miles of the continental divide, and is thought by some to be the last refuge of grizzly bears in Colorado. Officially though, the last one was killed here in 1979, near the upper Navajo River. There is one other road across the eastern mountains, where the summits are a little lower: CO 149 through the small villages of Creede and Lake City. These are also former mining towns and both make a good base from which to explore the surrounding wilderness. Visitor facilities are concentrated in the towns of Telluride, Ouray, Silverton and Durango, all rather upmarket places offering an assortment of art galleries, fine restaurants, souvenir shops and stores selling Western-themed clothing. 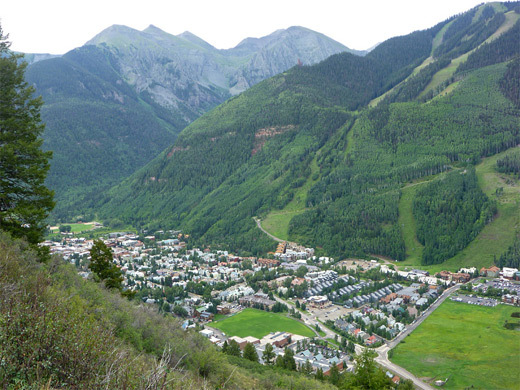 Telluride is the location of the main winter ski resort in the mountains, known as Mountain Village, on the south side of the San Miguel River valley; there are also two smaller ski centers, near Durango and Silverton. The mountains are crossed by many 4WD tracks, most remnants from the mining operations, and off road driving is a popular activity, visiting old silver/gold mines and other abandoned sites. 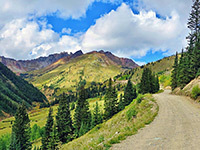 The easiest reached mine close to a paved road is around Red Mountain Pass (Longfellow Mine), along US 550 between Silverton and Telluride. 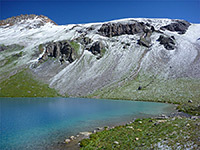 Numerous trails also climb into the hills, and in the western half of the range there are many places where the rocky terrain above the treeline is within reach of a day hike, such as Ingram Basin east of Telluride, Mill Creek Basin north of Telluride, Porphyry Basin near Red Mountain Pass and Ice Lake Basin near Silverton. Compared to other places in the Colorado Rockies further north, almost all areas are relatively quiet, even though the scenery is every bit as spectacular, and the trails are well maintained. The USFS operate several campgrounds along the main travel routes, and although free primitive camping is permitted in the surrounding national forest land, the steep terrain means that suitable roadside locations are somewhat limited. Towns with hotels close to the San Juan Mountains include Cortez, Durango, Montrose and Ouray.